If your client/Other vendor has given you XML . They want to import in to AX using AIF. Don’t try to import that xml according to standard schema of that service. 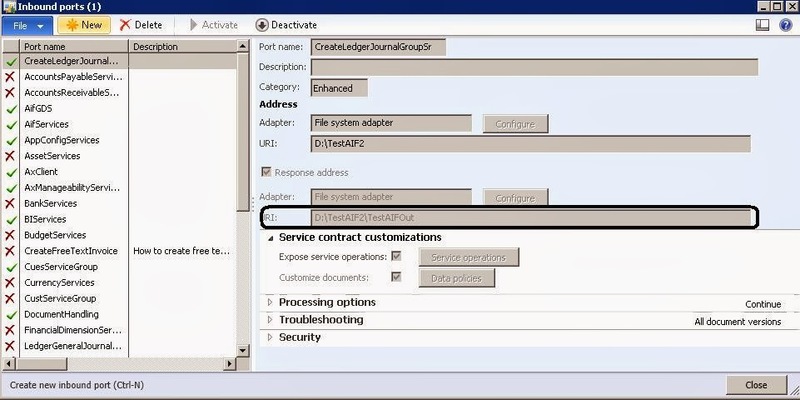 You must change customize schema from Data Policies inbound port according to you xml tags. After change of Data Policies you must change your XML tags according to sequence of Data Policies enabled fields. You can check schema nodes related to your action from AX then mention all nodes in your XML. The tag '/LedgerGeneralJournal/SenderId' is not allowed; it must be removed or marked null. 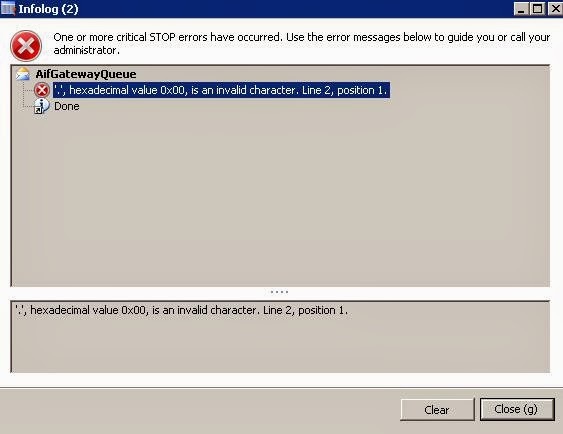 Error 2: Invalid document schema. The following error was returned: Could not find schema information for the element. Solution: you can verify your XML tags according to your XML schema from Data Policies. Error 3: The tag '/LedgerGeneralJournal/DocPurpose' is not allowed; it must be removed or marked null. Solution: you can verify your XML tags according to your XML schema from Data Policies. Or just pass null for that tag in your XML. Error 4: An error has occurred in the services framework. Method: AifMessageInspector::AfterReceiveRequest. Error: System.ServiceModel.FaultException`1[Microsoft.Dynamics.Ax.Services.AifFault]: Request Failed. See the Exception Log for details. (Fault Detail is equal to Microsoft.Dynamics.Ax.Services.AifFault. Stack trace: The company does not exist. I am using standard Schema of XMl when I am facing above issue. So I have modified my XML schema from data policies and enable that filed in my schema, add new tag of company filed in my XML. Solution: Check your service XML Schema and change tag according to Schema. If XML contain same value in tags of account and offset account then you can face above issue. Be make sure both account number and offset account value is change(i.e Account number = 0101 and offset account = 0102). Error 9: The request failed with the following error: Invalid document schema. The following error was returned: Could not find schema information for the element. When you are putt wrong tags according to schema. Check Data Policies on inbound port form and verify your XML tags according to schema. Solution: When you are putt wrong tags according to schema. Check Data Policies on inbound port form and verify your XML tags according to schema. Verify your XML file according to your XML Schema. Error 12: The request failed with the following error: Duplicate message. Message has already been processed. Error 14: The request failed with the following error: Creation has been canceled.